Friendly Beds is an American-made produce to improve independence, mobility and ultimately safety for both the person and any caregiver. 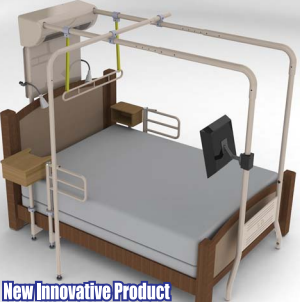 This heavy duty equipment is a free-standing system that can transform any bed into a personalized, state of the art solution to keeping you safe in your own home. This gives people a choice that never existed before- to remain sleeping with your spouse despite limitations due to age/disability. According to their website, Friendly Beds are especially ideal for the frail, stroke victims, or those with multiple sclerosis, muscular dystrophy, cerebral palsy, Parkinson's disease, arthritis, or spinal injury. It's easy! By simply mentioning that you first heard of Friendly Beds through Healthy Now and Later, you'll receive $50 off their smaller model and $100 off their larger model. That's it! Note: Seeing as this discount is only for those visiting Healthy Now and Later, this discount is available when calling direct to Bill-Ray Home Mobility and mention Healthy Now and Later (not applicable when located near a displaying dealer).